The food industry is now the most unequal sector in the American economy. Why is the gulf between executive compensation and average earnings colossal in the restaurant industry, in particular? One explanation is stagnation of wages at the bottom, abetted by low minimum wage standards. Fast-food workers are paid less than any other employees in the country, and that low floor has barely moved in a decade. The industry’s average hourly wage of $9.19 puts the salary for a fulltime worker below $19,000—poverty wages if she’s supporting a family of three. Most fast-food jobs aren’t even full-time; the average salary for average hours is under $12,000. Last year, fast-food wages fell to levels not seen since 2006. 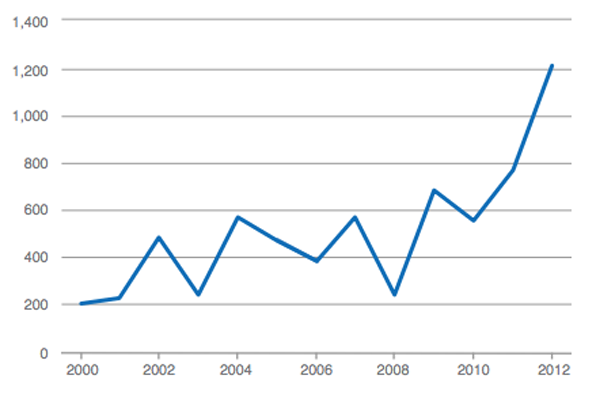 Meanwhile, compensation for fast-food executives has more than quadrupled since 2000. Those CEOs pocketed an average $23.8 million in 2013, making them among the highest paid people in America. Beyond the obvious hypocrisy of companies who throw millions at their CEOs while saying they can’t afford to pay their workers a living wage, the level of inequality within the food services industry has troubling implications for the whole economy. 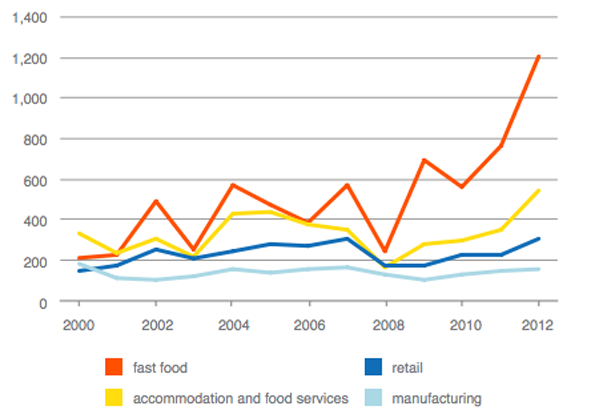 The jobs created in the wake of the recession have largely been in low-wage industries like food service. In other words, the jobs being added are the most unequal. Economists have pointed out again and again that inequality undermines economic growth, and there are more immediate costs as well, like the nearly $7 billion in public assistance that fast-food workers rely on to make up the gap between rock-bottom wages and the cost of living. According to Demos the pay gap could hurt fast-food companies themselves, with bad publicity affecting their reputation and low wages encouraging poor customer service. “Consumer are increasingly dissatisfied with their experiences at the biggest fast food companies,” the Demos report found. 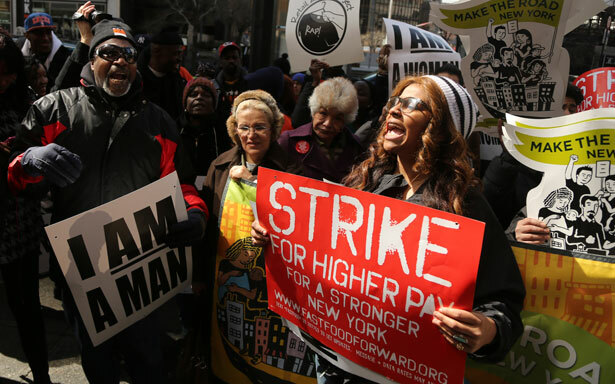 “In addition to operational issues, the low pay practices of fast food employers have opened the companies to expensive legal risks.” A McDonald’s franchise, for example, settled a lawsuit with employees over uncompensated work, wage deductions and other infractions for $500,000 in March, while class-action suits are pending in at least two states over alleged wage theft.